Verizon to begin pre-orders for the BlackBerry Priv on March 3rd, launch phone on March 11th? 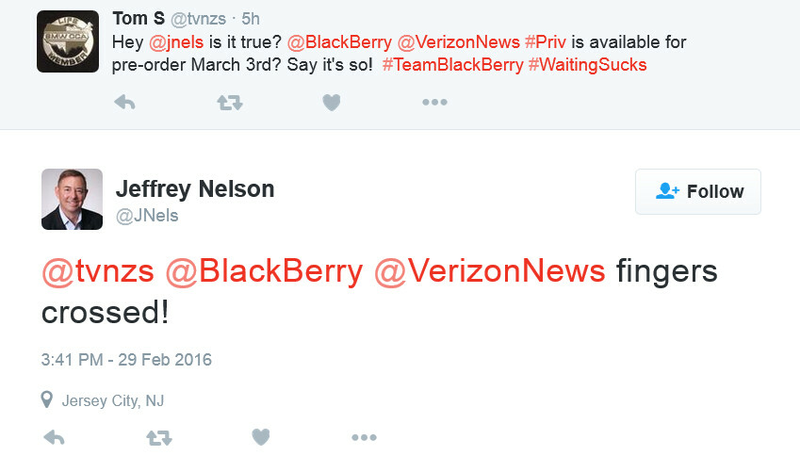 A tweet by Verizon executive Jeffrey Nelson in response to an inquiry, seems to confirm that the carrier will start pre-orders for the BlackBerry Priv on March 3rd. The Android powered slider would then be launched on Big Red's network on March 11th. The handset, BlackBerry's first Android powered smartphone, is currently priced in the neighborhood of $740 on AT&T and $720 from T-Mobile. The Verizon variant of the Priv passed the FCC on Christmas Eve, nearly two months after pictures of a Verizon branded Priv surfaced on social media. By the time January rolled around, there was talk of a March launch for the Verizon branded BlackBerry Priv. To refresh your memory, the BlackBerry Priv features a 5.4-inch AMOLED screen with a 1440 x 2560 QHD resolution. This works out to a 541ppi pixel density. The Snapdragon 808 SoC is under the hood carrying a hexa-core 1.8GHz CPU and the Adreno 418 GPU. 3GB of RAM is inside along with 32GB of native storage. A 2TB capacity microSD slot is available for those seeking additional memory. An 18MP camera adorns the back of the phone and includes OIS. A 2MP front-facing camera handles selfies and video chats. Keeping the generator humming is a 3410mAh battery, and Android 5.1 is pre-installed. We still expect Sprint to add the BlackBerry Priv to its lineup, which would make the device available on each of the four major wireless carriers in the U.S.
so its like the same price as the Galaxy S7 Edge that launches the same day? Who's idea was that!? Agree. And why would anyone want this compared to the s7 series with better features and monster specs? If you call horrible reception on any Samsung phone and the mess that is TouchWiz as better features, then by all means. Don't make generalizations when you clearly don't have a base to stand on, Crispin. I haven't had a problem with signal reception on ANY Samsung phone. That makes your first statement categorically false. In regard to your second statement, that's your opinion & I can respect that. However, I do disagree. I've OWNED the Note, Note II, Note III and Note 4 as well as the S3. They've all been horrible with reception and the issues are well documented. If a phone can't connect properly to a cellular service it's no better than a PDA from 2005. Wi-Fi is NOT everywhere. And that's fine, Crispin, but your experience doesn't equate to everyone else's so that makes your statement false regardless. Perhaps it has more to do with the service in your area. I've compared the signal reception on my Samsung devices to that of other OEMs. Better than some, not as good as others. Horrible? Far from it. That makes you look like a hypocrite. Your experience doesn't speak for everyone. Generally Samsung devices I've used have had decent signal but that's not to say they are the best because they aren't. There's many reports on the internet about signal issues on Samsung devices if you bothered to look instead of speaking from your rear. Cool story. Thanks for your input. Aka, I'm wrong and I am unable to come up with a comeback. What the heck didn't they use the same specs as the S7? The PRIV came out BEFORE the S7 did, and BEFORE the SD820 was even ready, so how would they have used the same specs as the S7? Use a little logic in your posts next time. They could have used the SD810, the same version running on the 6P. His question wasn't totally off the mark. And run the risk of the overheating issue? And had they used the SD810 anyway, individuals such as yourself would still have complained that it's not the "latest and greatest". Had you read my comment, you would have seen where I said: " the same version running on the 6P." That version does not have the overheating issues and many people have said it actually runs cooler than most phones. The SD810 is still pretty great, provided you get the refined version. Your last sentence is wrong, go figure. I haven't complained about the Moto X using the 810. I read your comment. Did you read mine? This is BlackBerry's FIRST Android handset. They obviously opted to go with the SD808 because of said hearing issues, which leads me to believe that the PRIV was in production before the latest SD810 version was released. Really? My last sentence is wrong? Because you've been constantly complaining about BlackBerry having not updated the PRIV to MM yet, even though the most popular and profitible Android OEM, Samsung, also has yet to do so, as well as several other Android OEM's. I have yet to see you complain about that concerning the others, so please don't act like you wouldn't make complaints about BlackBerry. The 6P was in production since March/April, so I don't see that being a concrete reason at all. Actually I've complained about Samsung not updating their more capable phones many times. I've complained several times about them not giving the Note 4 the ability to use the S-Pen with the screen off. For the record, I've called out Motorola many times so that's a pretty inaccurate statement. I haven't complained about the Moto X having the SD808. I've never seen you complain about Samsung not updating anything. Gonna need more "concrete" proof, like a link showing you complain about it. I've seen you TROLL Samsung and whine about how you don't like Touchwiz to no end, as well as TROLL Motorola as well, so I think my statement is pretty accurate unless you can provide a link proving otherwise. So you "haven't complained" about the Moto X having the SD808, but you've complained about BlackBerry using it in the PRIV...a bit hypocritical, don't you think? Of course you didn't see it. You have selective vision, you only see what you want to see. Yeah, I've complained about TouchWiz. So what? I'm not the only one who has done so here. Get over it. Your statement is full of sh- much like everything that's been coming out of your mouth recently. My complaint about the Priv is the price, if it was a little bit cheaper or had the same thing going for it as the Moto X does maybe I would be lenient on it. Again get over it. I've never seen because you've NEVER DONE IT. Otherwise, you would have posted a link proving so. And haven't just "complained about Touchwiz", you've TROLLED Samsung articles repeatedly about Touchwiz. I don't care if "you're not the only one that's done so here". The fact is you've trolled Samsung articles about it, period. Own up to your BS for once. So you've never complained about BlackBerry using the SD808? Is that the BS your trying to pass off as truth now? Because I can post a link where you have. Oh wait, you've done so in this very article! Lmao! Complaining about the price of a device you never intended in buying, as well as being ignorant of what the PRIV truly offers vs other devices marks you as a whining idiot. Get over yourself about BOTH those things, already. Like I said before, selective seeing. You see only what YOU want to see. I've said it many times that I loved the Note 4 and I've gone on record saying I would be watching for the Note 5 and the 6S before they were released. Lol I don't give a rat's @$$ if you want to believe it or not. Do I have to get a coloring book for you to finally understand it? If it offered as much value as the Moto X does then maybe I would consider it. You say I troll Motorola a lot, yet here I am praising the X over and over despite the bullsh- that spews from your mouth. Lol you just don't want to admit that you're wrong. Like I've just proven: You CAN'T provide a link because you've never done it. I don't give a $#!t how many lies you try and tell to pass them off as truth, I know better than to believe anything from a lying troll. Just because YOU don't believe the PRIV offers as much value as the Moto X, doesn't mean it's true. What that is, is subjective, but yoy keep trying to pass it off as gospel and force feed everyone your BS way of thinking. Yes, you HAVE trolled Motorola. INCESSANTLY. Just ask Scott. You need me to provide links? Because you KNOW I can. I don't care if you're praising one of Motorola's devices now, it doesn't change the fact that you've trolled them to know end. Cut the lies out and own up to your BS already, you fing coward. Lying troll, this is coming from the guy lying through his teeth after I exposed him admitting to having other aliases ironically from a link you yourself posted. IT'S WHY I SAID IT'S MY OPINION YOU NIMROD!!! Of course it's subjective, the only one who has trouble understanding that is you. Not surprised since you like to shove your opinion down anyone's throat who says something negative about blackberry. You're a hypocrite. Wrong, as usual. It's YOU that's been exposed by ME for having doppelgänger accounts. You were actually outed by the now banned Hexacore, and I further exposed you. YOU ALWAYS TRY TO PASS OFF YOUR OPINION AS GOSPEL, IDIOT. And yes, that BS you try to force feed everyone is subjective. If you know this, then STOP trying to pass it off as fact. The only hint getting shoved down your throat is the sack you jock, which is mine. And you're the hypocrite here, considering you have a fit like a bratty, snot nosed punk every time someone says something about Apple that your trolling @$$ doesn't like. This is coming from the same guy who immediately made his meanestgenius account after his previous account, the_alpha_geek got banned, as said so by himself when he admitted to having aliases. I'm not going to continue saying the same sh- over and over, which is what you're doing. Get your own responses. This is coming from the guy that made a faux account of himself in a pitiful attempt to gain sympathy from other PA users because he was getting called out for being the trolling buffoon that he is. You're not going to continue because you're DONE here. Now begone, I've whupped you enough for one thread. You're done, kid. Live to fight and lose another day. Let it go, Michelle. You've lost this one. Again.